10. 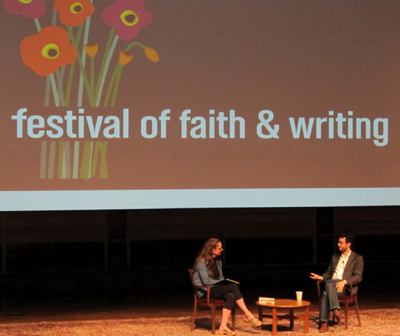 Learning from the diverse religious and artistic viewpoints of Judith Shulevitz, Jonathan Safran Foer, and Leila Aboulela. 9. Meeting in person - even briefly - some writers and editors I have enjoyed and respected online (like Rachel of Eat With Joy, Katelyn of Christianity Today, and Micha of Mama Monk), and also making new connections (how could Christie and I possibly have so much in common?) Although, I also have to admit that being at a conference with people I "know" from twitter felt kind of like a creepy preview of walking around with google glasses on. 8. Witnessing the graciousness and humility of Ann Voskamp in person. 7. Hearing fascinating stories of God at work around the world from Luis Urrea and Shane Claibourne. 5. Marilyn McEntyre on caring for words. A seriously inspiring woman, speaker, poet, teacher, academic. 4. The car trips with Jennifer. Two mamas of preschoolers, it turns out, have a lot to say when they actually get a chance to sleep a full night and finish a complete thought. And what a relief to discover that I do still like road trips! 3. And along the same lines, the chance to finish a thought- and even whole conversations! Whole meals! Whole lectures!- without being interrupted by: "You pretend to be a mama wolf, and I'll pretend to be a baby wolf who was shot by gunners..."
2. Hearing Marilynne Robinson speak. Twice. I don't know if there is another living writer for whom I have as much admiration. I'll admit to being a bit starstruck. 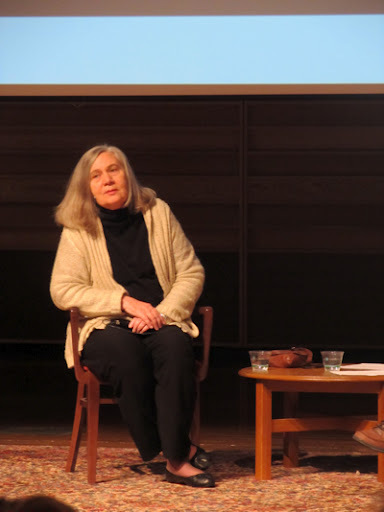 If you don't know Marilynne Robinson, I recommend to you Gilead. 1. The opening plenary session with Gary Schmidt, whose young adult novels make me cry. I think you should read them, and I'd start with the Newberry award-winningThe Wednesday Wars. I loved what he said about writers as servants, like Namaan's servant girl, suggesting to the pain of the world, "Why don't you try this?" The audio from the conference should be available online soon. I'll link to it. In the meantime, if you are interested, here is the book list I came away with. In "God", "books", "festival of faith and writing", "food", "friends", "road trips"